There are plenty of areas in Los Angeles where it's pretty easy to get around without a car within the neighborhood, but it can be a challenge to figure out how best to travel between these areas without a car. One such challenge is getting to Disneyland for the day or to relocate to another hotel for a few days if you're staying in Santa Monica. Or the reverse. It's best to not put Santa Monica and Disneyland on adjacent days of your trip, but sometimes it can't be avoided. Disneyland is about 43 miles from the Santa Monica Pier, which is a great reference point since most of the Santa Monica area hotels are in this general vicinity. A taxi from Santa Monica to Disneyland will probably cost between $113 and $140 dollars, depending on traffic. Taxi rates from Orange County to Santa Monica are slightly higher... or less since you'll probably be returning during off-peak hours, which would be faster, even though the miles are the same. If you have three to four people traveling, a taxi may be a good option. If you have more than four, you can ask the taxi company if they have a vehicle that will accommodate you or take multiple taxis. For two adults and two kids (or four adults with three in the back), you'll probably pay $226-280 round-trip for door-to-door service from Santa Monica hotels to Disneyland, or $56.50-70 per person for four, $113-140 each for two people. Santa Monica has five companies licensed to operate taxis in the city. They all use the same fare schedule, which is the same as the City of Los Angeles. Personal ride-share apps allow you to catch a ride in someone's private car for a much lower fee than a taxi would charge. Three services operating in LA are ​Uber/UberX, Lyft, and Sidecar. All three apps will allow you to see what cars are available nearby, find out how much they will charge to take you where you want to go, book the car and pay for the ride all on a smartphone app. No cash changes hands. If you want a little luxury, or have more people than will fit in your average taxi, you might consider multiple taxis or a hiring a private car. Vehicles range from four to 35 passengers, from limos to SUVs and vans. 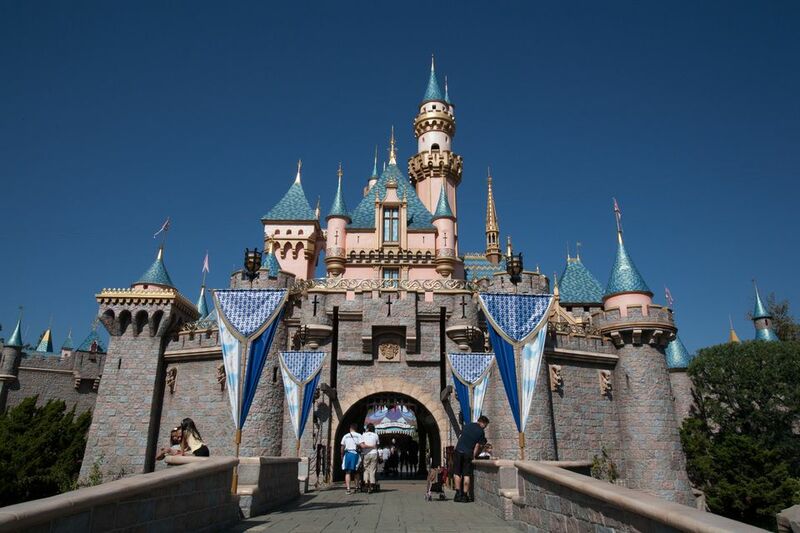 After a taxi, rideshare, or door-to-door car or coach service, the easiest way to get from Santa Monica to Disneyland if you're just going for the day is to buy a Disneyland ticket with transportation from LA area hotels, including Santa Monica. A bus will pick you up at your hotel and take you to Disneyland. Take just one bus, and in an hour to an hour and a half, you'll be at the Magic Kingdom. The bus picks up passengers from Santa Monica hotels at a specified time in the morning (specified by the bus company), and depart from Disneyland at 7 p.m., with a 10 p.m. option in summer. It might take a while for multiple hotel pickups, depending on how many hotel pickups are scheduled. If you aren't staying at one of the hotels, you can still get picked up at one of the hotels though. An additional limitation here is that they only sell single park tickets for either Disneyland or Disney's California Adventure. You don't have the Park Hopper ticket option that gets you into both parks on the same day. If you're staying in Los Angeles, Starline's LA Hotel Pick up Bus to Disneyland is a great option. Their Disneyland tours are designed to make your trip easier. The tours provide return transportation to and from Disneyland with admission included in the price. If money is a bigger issue than time, it is possible to get from Santa Monica to Disneyland on public transportation, and you only need to transfer once. You can use LADOT Transit, Metro Trip Planner, Google Maps, or Bing Maps to look at options. They each come up with different solutions. Metro Trip Planner has the most direct and fastest route, which is to take the Santa Monica Rapid 10 bus to Figueroa and 5th Street in Downtown LA, then walk a block to Flower and 5th Street to take the 460 Metro Express bus to Disneyland. That will take about 3 hours and costs are very inexpensive.